I love filling our house with Biblical resources and I enjoy taking some time to educate myself. The new books from Apologia Educational Ministries allowed me to do both! 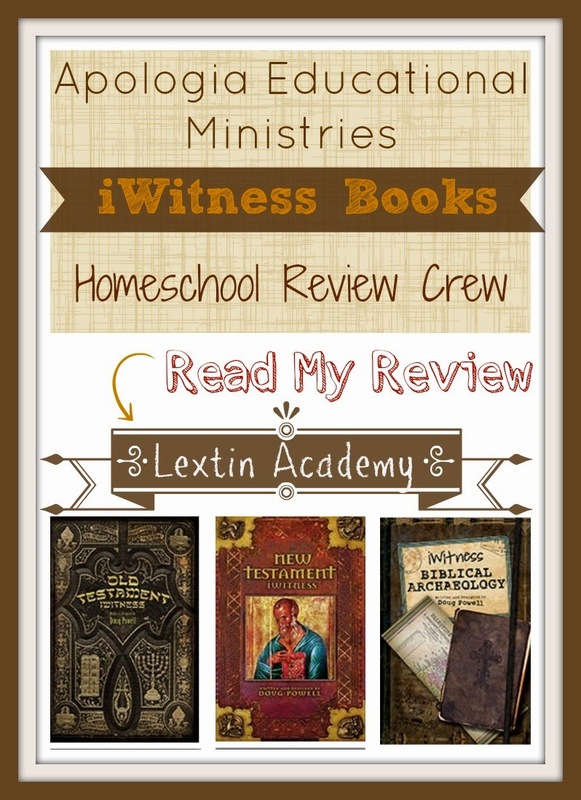 I was able to review 3 books about Bible history and archaeology: Old Testament iWitness, New Testament iWitness, and iWitness Biblical Archaeology. Apologia Educational Ministries is best known for their creation-based science resources for elementary through high school. They also now produce worldview curriculum as well as publish encouraging books for homeschool families. This family-owned company has a mission to encourage and equipment homeschool families learn, live, and defend the Christian faith. Old Testament iWitness is a book that contains scholarly information about the history of the Old Testament and how the books were chosen as part of the canon of Scripture. It also describes the differences between the Old Testament and the Hebrew Bible and who is believed to have authored each book. New Testament iWitness contains information about the authors of the New Testament. This book also describes the process of copying and preserving the documents, explaining how we can know we have an accurate version of the original text. iWitness Biblical Archaeology is a journey through the major archaeological finds that validate the truth of Scripture. The facts about the time, place, and people who discovered the pieces of the puzzle that affirm Scripture are included with multiple images of the artifacts. In each of these books the information is presented as if written on parchment like an ancient document. Various pictures are interspersed throughout the pages to depict ancient documents and historical locations. The reader is challenged to wade through the information as if doing an investigation to understand the facts of Scripture and the history behind the writers and books. The books are written at about a reading level for ages 11 and older. However, the information in the books appeals to any age. I would recommend these resources for children at least 11 or older, however. I found the books highly educational and interesting as an adult. I read through these books first myself to see if the information would appeal to my children (and be understood by them). After reading through the books, I passed them on to my husband who enjoyed reading through them as well. Then I went back through and chose a few snippets to share with our kids. They especially enjoyed seeing the pictures of the ancient manuscripts and archaeological finds. Much of the information was too complex for my kids (ages 8, 6, 5, 3, and 1). However, I found that my 8-year-old found several pages to be very interesting. I read through these pages with her and helped her understand the concepts. She would not have been able to read the books on her own. My daughter was especially interested to learn who authored many of the Old Testament books. She also enjoyed reading about how the books were copied by scribes who were careful to avoid errors. Her favorite book and the one that she found most understandable was the archaeology book. She enjoyed hearing about the search for Noah’s ark and the discovery of the Dead Sea Scrolls. What were my favorite facts? Do you know who wrote the first Scripture? God – as He inscribed the Ten Commandments on stone tablets to present to Moses. The idea that God was the first author of the Bible gave me chills. His Hand is literally all over Scripture. Many scholars believe that Matthew and Luke used the book of Mark as a source for their own writings of the Gospel because there are 350 verses of Mark in the book of Luke and 606 verses found in the book of Matthew. John then wrote his book to include more details about the deeds done by Christ in His very early ministry days. I loved reading how the Gospels fit together and agreed on the facts, yet were each written to a unique audience. Who was the Pharaoh during the time of Moses? While we are not sure, the new chronology theory suggests a couple of different pharaohs who were the last to rule in their dynasty. After their death a new family ruled Egypt which explains why the new Pharaoh does not remember the story of Joseph and begins to oppress the Hebrews. Mummies of some of these Pharaohs have not been found which would sync with the Biblical story of the Pharaoh drowning in the Red Sea. I love history so I loved reading about the history of the first churches, the saints, the church leaders, and how the events of history are accurately portrayed in the Bible. I felt like I had a mini-history lesson after reading through these books. I think my favorite book was the one about archaeology. I was fascinated with the different finds and enjoyed reading how they validated Scripture. These finds included lots of pictures of the location and pictures of the discoveries. The pictures were wonderful and I found that Curly enjoyed looking through them as well. These books were not a quick and short read. I found myself going back over them and rereading the pages many times to understand the information. The books are packed with information and not all of it is easy to follow. I learned about the different manuscripts and how the Bible was translated and how the books of the Bible were chosen as Scripture. I had to keep the different church fathers and canons straight-this was not easy! For this reason, I only read portions of each book to Curly so I would not overwhelm her. I enjoyed these books for me but I probably would save them until Curly was at least in middle school. The books contain pictures of old manuscripts and locations of archaeological sites. I loved all the pictures but I did find the pages to be very busy. They almost had a scrapbook-like feel to them with pictures and text interspersed randomly throughout the pages and at varying angles. This made reading the books somewhat difficult for me as I found the pages distracting. I realize that the books are meant for the reader to dig and discover and explore the texts as if they were investigating the documents themselves. I love that concept but I found the pages to still be challenging to navigate. My biggest complaint is some of the fonts. When you are reading about challenging subject matter it’s hard to struggle to read some of the text and question if a letter is an “n” or an “r” or if you’re seeing a “y” or a “j.” The text blocks were typed in bold fonts that were meant to look like the writing of ancient scrolls. They looked authentic. However, sometimes the English started to look like a foreign language as I tried to read the various fonts. A few of the fonts were easier to read but a couple of them were very challenging for me. I would prefer fonts that were easier to read. These books are some tough reading with loads of Biblical information and historical facts. As I was reading them my only thought was, “Mind. Is. Blown!” I found that much of the information was new to me and I found it fascinating; however, these books are quite challenging with complicated concepts and references to different texts and manuscripts. They take several readings to fully comprehend the information. But I found it was worth it to pore over them again and again to understand the back story of our Scriptures. Books can be purchased from Apologia.